You can set your Project Library to list projects alphabetically or with the most recent projects at the top. You can also organize your projects into folders in the Project Library. This is useful if you have a lot of projects and want to be able to find them more easily. 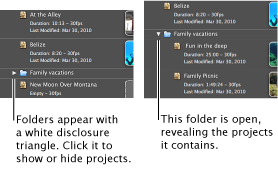 You can put all your travel videos into a Travel folder, all birthday videos into a Birthdays folder, and so on. Click the Project Library button to open the Project Library. When this option has a checkmark next to it in the menu, projects are listed chronologically. When this option has no checkmark next to it in the menu, projects are listed alphabetically. You can create as many folders as you like to organize your projects. If New Folder is dimmed (can’t be chosen), click anywhere in the Project Library and then choose New Folder again. Type a name for the folder in the Folder Name field, and then click Create. Select a project and then drag it to the folder. To open a folder, click the white disclosure triangle to the left of its name. To close the folder, click the disclosure triangle again.